Does your middle schooler love math or loathe it? With the right math games, you can your child develop a true love for math. If you have a seventh grader at home, try out these different math games. It’s a great way to give your child math practice to develop and improve their skills while having fun. This is a math game for 7th graders that is played similar to war. To start, pass out the cards so that the entire deck is distributed evenly among the players. Players should leave the cards face-down on the table in front of them. Next, each player will flip over his or her top card at the same time. The first card that is dealt is the base. Then, the players flip the next card. This is the exponent. The player with the highest product wins all of the cards! So, for example, if player 1 flips a 5 followed by a 2, then he calculates 52, which is 25. In the same round, player 2 flips a 2 followed by a 10. She calculates 210, which is 1024. Player 2 would be the winner of that round and take all four cards. If a tie is produced, all of the cards for that round are shuffled, and each player draws one. The player who draws the highest value gets to keep the cards. Play continues until all of the cards have been flipped. The player who has the most is the winner. This game helps enforce basic math skills and concepts. 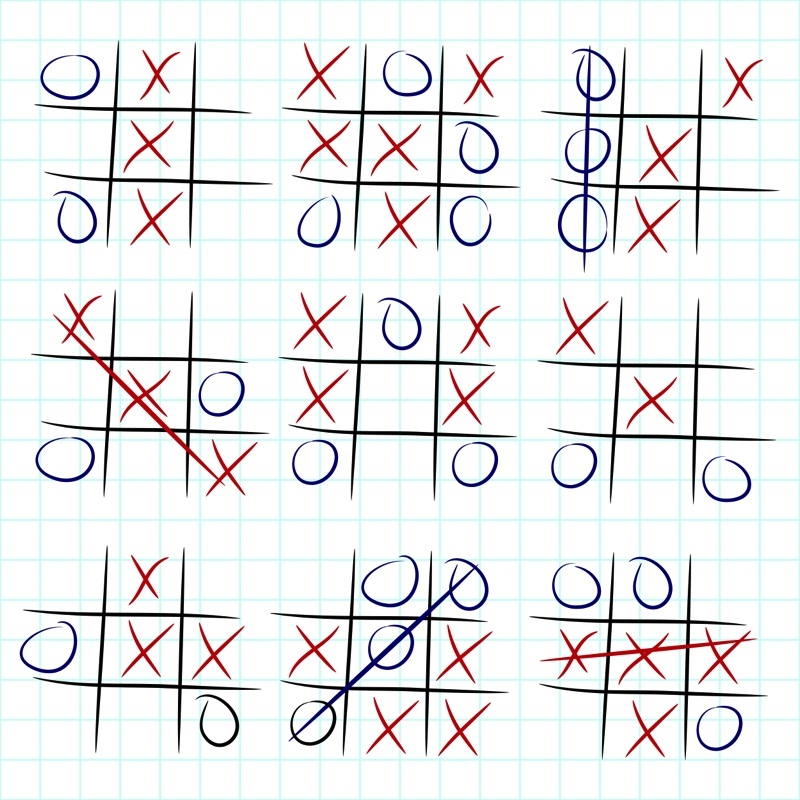 To set this up, draw a tic-tac-toe board on a sheet of paper. Then, make number cards with a handful of fractions written on them. For each turn, each player draws four cards. Then, using multiplication, addition, subtraction, and division, the player must use those cards to get to 1/2. Here’s an example: If the player draws 1/4, 1/3, 2/3 and 3/4, the student can begin by adding 1/3 and 2/3 to get 1. Then, she can multiply that by the 3/4. Finally, the student can subtract 3/4 – 1/4 to yield 2/4 or 1/2. When a player is able to get to 1/2 using her cards, she can place an X or O on a square on the grid. Play continues, with the cards returned to the pile and shuffled before the next draw, until a player gets three in a row. If a player is not able to get to 24 on any turn, that player must skip the turn and try again the next round with a new set of four cards. This is one of the math games for 7th graders that is engaging for students and a little challenging too. It’s a great game to play at home as you try to encourage your child to practice these basic skills. In seventh grade, students need to get more practice with positive and negative integers. To play this game, grab a stack of 50 3×5 inch note cards, some markers, and some scissors. Cut the cards in half, giving each player 50 cards. On the cards, each player should write integers, both positive and negative, from -20 to +20, including 0. Once the cards are ready, the players will “face off.” Play begins with the first player laying his top two cards face up. He then adds the two cards (paying attention to the negative signs). Player 2 follows suit, also adding her two cards. The player with the highest sum will keep all four of the cards (similar to War and the Exponent card game). Play continues until one player has finished his or her stack. The player with the most collected cards is the winner! Try an online math tutoring program for more math practice! The math games that we shared aren’t complicated at all to set up and play. You can do them with objects you likely have around your house! If you are looking for other ways to supplement your seventh grader’s learning or provide additional practice at home, consider an online math tutoring program. Thinkster Math is a math learning program that provides a personalized path and engaging incentives to help children excel in math. Find out more about Thinkster today and see how we can help your child feel more engaged and confident in their seventh-grade math class! Math for 7th graders doesn't have to be difficult and torturous. Here are some games that help make math fun and engaging for them.